Learning a new language can be a fun, useful, and lucrative thing to do. By learning a new language you can give yourself more opportunities and options when it comes to where you want to work and live. Choosing what language you desire to master should be based on your preference but also on the following factors: The language is useful and necessary. The language is moderately easy to learn. The language is spoken around you often. Have you ever wanted to learn Chinese? Did you know that you can learn everything you need to about the Chinese language on the internet for free? Did you also know that the Chinese make up the greatest percentage of internet users? If you want to learn Chinese it is recommended you start with a simple tutorial like “How To Learn Chinese For Beginners” so that you can familiarize yourself with what the lessons will consist of. Learning Chinese can be challenging so you want to make sure you have the right approach to this complex and fascinating language. “How To Learn Chinese For Beginners” gives a good example of what the lessons will be like for speaking, reading, and writiing in Chinese. It is also recommended to learn the Mandarin dialect when studying Chinese. There are several different dialects but as of today Mandarin is the most widely used and keeps growing in its popularity. Learning Mandarin Chinese can be time consuming as well as very involved. Make sure to set aside enough time to dedicate to your studies. You will be learning how to speak, read, and write Mandarin Chinese all at the same time. With the beginning lessons outlined in “How To Learn Chinese For Beginners” you will focus on simple phrases used every day. Not only will you be learning these phrases, you will also learn the correct usage and grammar points of all the phrases you use as you continue to learn to read and write in Chinese. You will become familiar with Pinyin, a phonetic system of the Chinese language. This will be the way you learn the proper pronunciation of each word and when speaking the Mandarin dialect you will be taught the proper tones and pitches to use and when and how to change those tones and pitches. Tones change in Mandarin Chinese based on the the variation of a syllable’s pitch. This is indicated by a tone mark and may distinguish meaning. There are four tones, with the first tone being a high pitch and even. The second tone is a rising tone that starts from a high pitch and rises briefly. The third tone is a known as a falling rising tone, where your pitch starts low and then rises. The fourth tone is a falling tone, starting at a high pitch and then dropping briefly. There’s also what is referred to as a neutral tone. This is indicated as short and unaccented with a naturaly extended pitch of the the tone that was used before. This neutral tone is conveyed by the absence of a tone mark. A simple rule to follow is when one low tone follows another, the first one becomes a rising tone. Mastering the proper pronunciation depends greatly on getting the tones right. The utilization of various tones proves to be not much different than the English intonation that we use on a daily basis to emphasize a word. Using the change of tone and pitch is what we refer to as inflection in English, in Mandarin you apply this same concept. This technique proves to be one of the hardest obstacles to overcome while learning Chinese. There are twenty one initials in Mandarin Chinese. When using the initials in Chinese, twelve of them have almost the same pronunciation as they do in English. The Chinese initials that are pronounced the same as their English letter counterparts are m, f, n, l, h, and sh. There is also a technique using one’s breath to be used with tone. There is some special attention to be paid on the breath when speaking what are known as “aspirated consonants” In these instances when pronouncing an aspirated consonant you should breath heavily after the original consonant is sounded. These are all basic rules to familiarize yourself with as you prepare yourself to learn to soeak Chinese. Next we come to the Finals. The finals in Chinese are somewhat like an English vowel but there are thirty six of them in Chinese. Six of them are simple finals (a, e, i, o, u). The other twenty nine are known as compound finals. There is more information not covered here that is available on the internet regarding finals and how to use them all. This is just a brief overview. Now that you have some understanding of how the Mandarin Chinese language is spoken you will want to understand how to write it. Unlike the English language Chinese writing is non-alphabetic and non-phonetic. The meaning of a character can be learned without knowing its pronunciation. Chinese writing is mostly done as simplified writing. It is written horizontally from left to right. In Hong Kong, Taiwan and most Chinatowns around the world, traditional characters are used but they are written vertically from right to left. In all Chinese writing the characters must be centered in an imaginary square without filling the entire square. The main rules to remember about writing Chinese are the strokes and the stroke order. There are eight fundamental strokes and eight essential rules of stroke order to follow. There are many websites and instructional videos that you can use to help you along the way as you begin learning the Chinese language. The most important thing to remember is to understand that you are learning a second language and to not let your knowledge of your native tongue become a handicap while attempting to learn a new language. These are beginner tips that have been shared and should assist you well as you set out to learn Mandarin Chinese. Never make learning the language a chore. Keep your study time brief but focused and only study for a few hours a day. 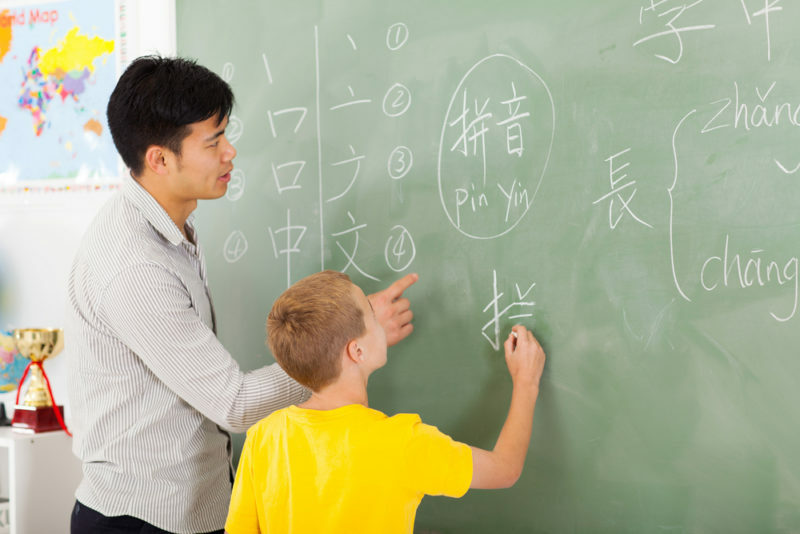 With as intricate as learning to speak, read and write Mandarin Chinese is, you want to make sure you are enjoying your lessons because you will find it will be easier to learn everything you need to know when it remains pleasurable.